I was a little worried about this trip to Warsaw, it would be a 20 hour train trip. I got a first class train ticket because it has only two beds. Almost all the short distant trains I got in Russia there was a drunk man sitting next to me. I started to imagine 20 hours smelling someone’s alcohol breath. I ends up being lucky, there was nobody sharing the cabin with me. I was by myself. There was no passport check when we left Russia and entered Belarus. The way out from Belarus they came to see if I had the transit visa. I had to pay 45 dollar to get it in Moscow. I believe almost all nationalities need a transit visa just to go through Belarus in the evening. People say it is just for them to make some money out of the tourists. I arrived in Pozadas at 10am. I went to get my backpack and it wasn’t in the bus. Neither the one from a German friend that came from Salta with me. They told us that our luggage was sent (by mistake) to Glorinda, a city in the border with Assuncion (Paraguay). We had changed the bus at 5am, they told us to not worry with the bags that they would move from one bus to another. They just forgot to tell us that they usually forget some. We complained at Nueva Estrella Office. They told us this happens a lot, and we would have to wait until 1am when a bus from Glorinda arrives. It was a cold and rainy day. There was not to do in town, we would have to wait the whole day in the bus station. From San Pedro Atacama this trip to Argentina took 12 hours. The Chilean road was good and paved. The desert-like landscape and with impressive lagoons. 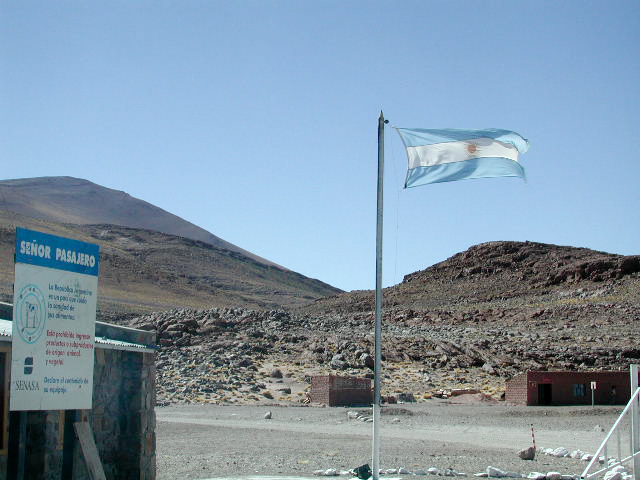 When entering in the Argentinean side, the road got worse, no more pavement. We stopped at the Argentinean customs and immigration. When I saw from far away the Argentinean flag I got emotional. I felt I was getting home, getting closer to my culture. Sometimes the Bolivian immigration Office in the border with Chile is closed. In order to not have problems I decided to get my exit stamp on the passport in Uyuni. In Bolivia you pay $15 Bolivianos to get out of the country. I’ve never seen that before in other countries. When we got to the border, our tour group split. 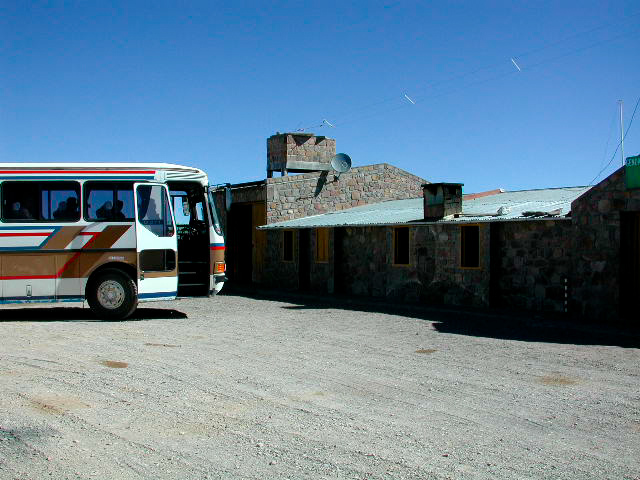 Some went back to Uyuni and others got the bus to San Pedro de Atacama. The bus stopped by the Bolivian Immigration office, this time they were open to people stamp the passport. Then we continue to Chile. On the border line we could see the difference between the countries. The Chilean road was new and paved while the Bolivian one had sand and rocks. Crossing the border from one country to another is not a good experience around here. It is even worse if there is threats of closing the roads by the Bolivian farmers that were on strike. I knew I couldn’t go to Copacabana because the roads were closed as a form of protest. I went to the Bolivian consulate to know if I would have problems and they told me to cross the border through Desaguadero (a frontier city in Peru). It should be a longer but safer way. Crossing the border between Ecuador and Peru is not a pleasant thing. When I got off the bus in Huaquilla (Ecuador) about 20 men came around me trying to sell transport to Peru and offering to exchange dollars. One caught my backpack while the others fought for deciding who was going to take me. The place was horrible. It looked like with some parts of Ciudad del Leste (in Paraguay). I walked about 400m to the bridge on the border. I was carrying my backpack and always begging them to leave me alone. They continued walking with me, they were all talking at the same time and trying to sell me something.